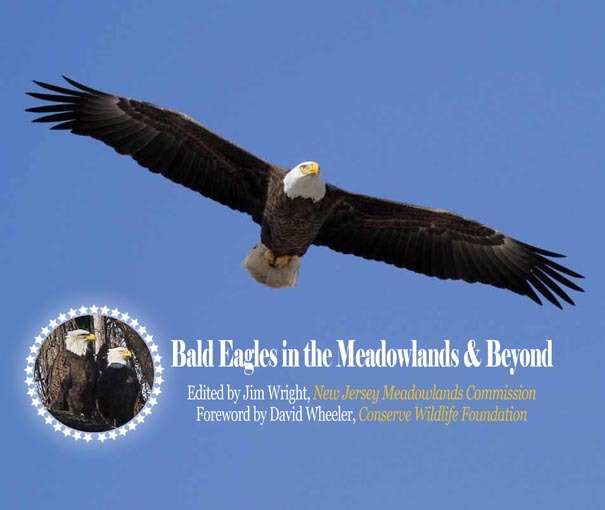 “BALD EAGLES OF THE MEADOWLANDS & BEYOND” IS A FREE, 62-PAGE ONLINE BOOK ABOUT OUR NATIONAL SYMBOL’S REMARKABLE COMEBACK IN NORTHERN NEW JERSEY AND ACROSS AMERICA. The lavishly illustrated e-book, sponsored by the New Jersey Meadowlands Commission and Conserve Wildlife Foundation of New Jersey, features chapters by raptor expert Scott Weidensaul, Kathy Clark of the N.J. Endangered and Nongame Species Program, and the American Eagle Foundation. The full-color book also showcases images by 19 nature photographers and five illustrators. Photo courtesy of Ron Shields. Contributing photographers: Louis Balboa, Jerry Barrack, Al Barrera, Jana Brusich, Dave Chanda of N.J. Division of Fish and Wildlife, Kathy Clark of N.J. ENSP, Greg Gard, Mike Girone, Muhammad Faizan, Alice Leurck, Bill Menzel, Greg Miller, Doug Morel, Fred Nisenholz, Allan Sanford, Ron Shields, Mick Valent of N.J. ENSP, Roy Woodford and Jim Wright. Read the free e-book online on your computer. To turn the pages of the e-book, click the lower right-hand corner. Read or download the free e-book on your tablet. Purchase a hard cover or soft cover print-on-demand copy of the book at cost. Note: Due to the nature of on-demand printing, these books can be a tad expensive.